How does the author, Arthur Conan Doyle, depict class differences? This question feeds in directly into Victorian attitudes, both through the minds of the author and his characters. As educated, white males Doyle and Holmes seem to belittle virtually every other human experience. Though they rely on the lower classes for tasks of manual labour, neither mans treats them with very much dignity. This question is designed to make the reader think about whether the author (and by extension his characters) were in fact classist or sexist (as was common during the time), or wether Doyle was simply trying to create a realistic reconstruction of the period, warts and all. If Sherlock Holmes is the protagonist, then why is his assistant, Dr Watson, narrating the story? This question is supposed to challenge the reader about who in the story they identify themselves with – the archetypal hero or his less intelligent, but more likeable helper. Unlike most third person narration Watson is not merely a spectator, but has an active role in the outcome of the plot. Watson is really a surrogate for the audience, as he receives all the facts of the case, and while he is able to dissect them calmly and logically, he lacks Holmes brilliant, intuitive intellect. Watson allows the reader to join him as he attempts to decipher the events, whereas, if Sherlock Holmes were telling the story, we would have little opportunity to solve the mystery ourselves. At the climax of the story, Watson observes, “In that impassive, colourless man, with his straw hat and his butterfly-net, I seemed to see something terrible—a creature of infinite patience and craft, with a smiling face and a murderous heart.” What is Doyle trying to convey in this passage? This passage, without context, is supposed to summon up the image of Holmes himself in the readers mind. Watson is of course talking about Stapleton, but phrases like “infinite patience” and “craft” represent elements of Holmes’ own intellect. Watson, in many ways, is describing an adversary worthy of Holmes’ skills, because he masks his evil with a gentle nature. Because the question lacks context is was designed to create a parallel between Holmes’ and the criminals he hunts. The passage also gives us an idea of Watson’s incredible trust in his master. It wasn’t until Holmes had revealed the perpetrator, that Watson could see the wolf within the sheep’s clothing. Could Holmes be wrong about the killer? It doesn’t matter. Watson’s trust is absolute. The Adventures of Sherlock Holmes: Detecting Social Order, by Rosemary Jann, is an excellent study of Victorian England’s social mores, as depicted in Doyle’s original 12 novellas. Jann identifies the oppression of the lower/working classes inherent in the stories, where the middle and upper class characters, like Holmes, have control over their lives, and have their every whim tended to. It also examines why the lower classes so commonly represent the criminal element of 19th Century detective fiction. 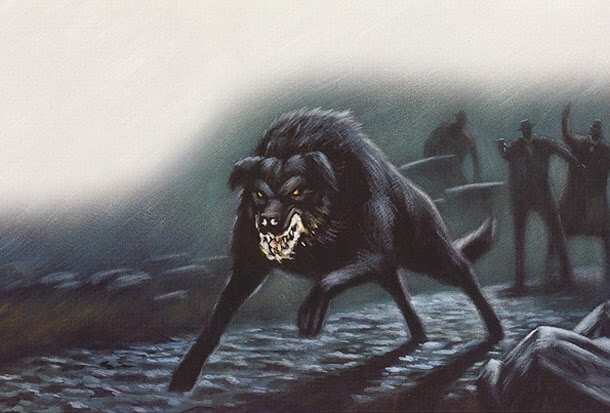 The Hound of the Baskervilles, directed by Sidney Lanfield, is arguably the best-loved adaption of the story. It stars Basil Rathbone as Sherlock Holmes and Nigel Bruce as Dr. John Watson. While some of the details of the original novella were omitted, the gothic atmosphere, and the brisk pace of the plot have won the motion picture a devoted following. The Murders in the Rue Morgue, by Edgar Ellen Poe, is considered the first detective story ever, at least in Western literature canon. Published in 1841, the short story is about the mysterious and brutal murder of two Parisian women, and the man who attempts to hunt down the perpetrator. Poe established many literary devices which would be used in future detective fiction, including Sherlock Holmes and Hercule Poirot.